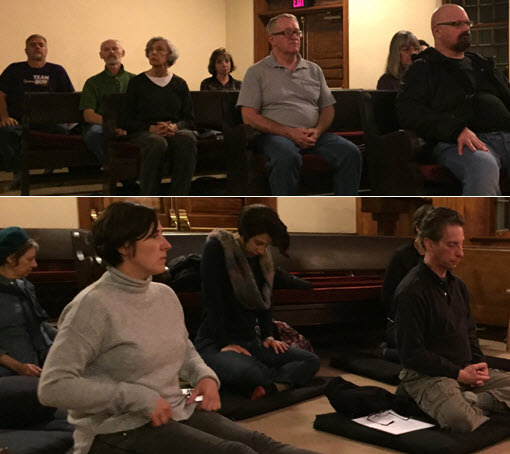 The Buddhist Sangha of Bucks County is a community of friends practicing the Dharma together. It’s a place we go each week to support each other in our practice and in our struggle for awareness. Thich Nhat Hanh describes a Sangha as more than a supportive community, but as a deep spiritual practice. Working together, we support the desire to awaken our deepest understanding of life through meditation practice, Dharma discussions, and opportunities for compassionate community service. We started the year once again with our traditional New Year’s Eve mini-retreat with Jeanne Reis and BSBC founder James Reis. Our long-time teacher in the Tibetan tradition, Lama Gursam, honored us with multiple visits. His first was at MFM on a stormy Friday in March. And on Saturday, Lama provided a wonderful Dharma talk, reading from Milarepa’s Songs. He’ll be with us there in another few weeks. It was quite a year for our Sangha. 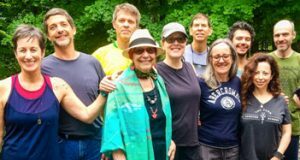 We embraced change; we saw a few members step down from their previous roles and we saw new members step up to enrich the spirit of our Sangha. We benefited from a programming committee with tremendous depth, creating rich programs throughout the year, and further connecting us with truly skillful teachers from various traditions. Spring was a time for introductions. 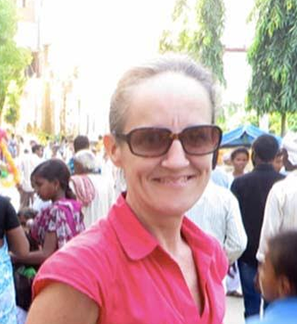 Moira Kowalczyk introduced us to Padmadharini (PD) who is ordained in the Triratna Buddhist Community. She led us in a 6-week meditation series. Little did we know this would be the beginning of a significant relationship with a new teacher who has graced us with her open, practical, and heartfelt Dharma offerings throughout the year. Philip Murphy brought George Haas to Yardley who guided us in meditation and gave a Dharma talk on ‘The Meaningful Life’. 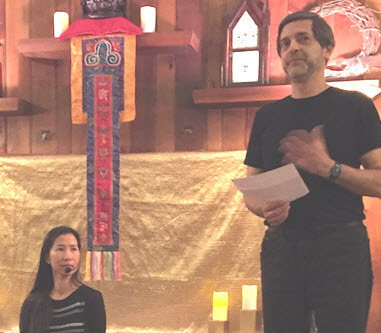 Rebecca Li (pictured on the left with Dave) from the Dharma Drum Chan tradition visited us twice, presenting Dharma teachings on ‘Silent Illumination‘ in April, and on ‘The Bodhisattva Ideal’ in November. Padmadharini hosted two additional programs. In July, a 4-week series on ‘Wisdom Factors’, and over the past 2 months our Sangha has been enjoying an 8-week study group ‘Going For Refuge,’ with able assistance from Triratna student, Elaine Smith. It has brought members of our Sangha closer together in a true spiritual sense. Several Sangha members also attended a residential retreat at PD’s and Elaine’s Blue Sky retreat center in Stockton, NJ. Inside and out, the center is as warm and welcoming as the lotus plant from their pond. As has been a long-running tradition at BSBC, several members led lively discussions on numerous Buddhist topics. Moira & Philip M. each led on multiple occasions, along with Dave, Lowell, John Wentz, and Eugene & Anna. The effort put forth to develop rich content and initiate wonderful discussions amongst our members and visitors is such a treat and a draw. In addition, the book club has continued to thrive, serving as another vehicle for providing the BSBC family with a warm, personal environment in which to explore a couple carefully selected books each year. The year was not without loss. In May, we lost one of our own—Brian Jennings. Several members attended a ceremony hosted in Bristol with family and friends. Brian was a warm spirit and will truly be missed. As we’ve grown closer to Moira, PD, and Elaine, we’ve also learned more about the Triratna tradition and we were all impacted to learn of its founder Sangharakshita’s passing just a few weeks back at the age of 93. Three standing committees were created by the BSBC board as part of the bylaws revision three years ago. The committee structure has helped to organize our activities and spread responsibilities among our group of dedicated and talented board and general members and friends of the Sangha, who all pitch in to make our community function to benefit all. Communications Committee: (Co-chairs: Eugene Pevzner, K.C. Focht, & Joe Beck, with support from Marc Kaye). The committee focuses on BSBC’s visibility on digital platforms. Contributions by several members and friends appeared regularly on our website, Facebook page, and Twitter account. Special events received special treatment through traditional means as well, through advertising in local news outlets, and creating and posting flyers. Eugene has been at the helm of the BSBC weekly e-newsletter, our primary communications vehicle to members for many years. Eugene and Joe have continued to create an increasingly robust website with audio recordings available for many of our visiting teacher’s offerings. Program Committee: (Co-chairs: Moira Kowalczyk, and Philip Murphy, with help from Lowell Arye,). 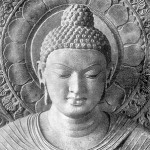 We have studied the Buddha’s teachings and related practices and traditions through the many visiting teachers enumerated above, through several extensive month-long programs targeted at a variety of Buddhist topics, through the book group hosted by board member Edna Telep, and members Jeff and Roseanne MacNair, and through our weekly discussions. Many board members led discussions as noted above, with special thanks to Moira for providing consistent leadership over the entire course of the year. Outreach and Service Committee: (Co-chairs: Rika Barrett & Diana Collinelli). We have continued our outreach and service activities through contributions to the Bucks County Emergency Homeless Shelter, organized by Rika & Diana, who strategically target our contributions in response to the expressed needs of the shelter. The BSBC jumped in with both feet launching an active drive to support the ‘Backpack Challenge’ run by The Valley Youth House (VYH). This program raises funds and collects essential back to school items for foster care youth. Our Sangha contributed 3 Google Chromebooks (a value of $750) and 4 boxes of stationary supplies. The energy that Diana brought forth to really lift this effort was inspiring. The outreach & service committee also facilitated having Woody from VYH come and share with our Sangha his mission and help us understand their program and specifically what he does to help these struggling youth. BSBC looks forward to continuing to work with both the Bucks County Emergency Homeless Shelter and The Valley Youth House going forward. We also continued to bring awareness of Buddhist teachings and our presence in the area through four invited contributions for the Bucks County Courier Times column, From a Faith Perspective, written by board members Phil Brown and Joe Beck. Louise Wile, our long-time librarian, has been updating our lending library when possible but we’re in need of more help. The initiative led by Dave Mermelstein to expand the library seems to continue year after year, and we received contributions of additional resources from other donors as well, including Philip Murphy offering a box from NY IMS with Bhikkhu Bodhi books amongst others. Financially, we ended the year with a balance of approximately $5,250. These expenses included payment for our rent for the year based on $90 per Monday evening and special events at the Yardley and Makefield Friends Meeting Houses. Thanks to our treasurer, Rika Barrett, for handling the expenses and records with both caution and a spirit of generosity. The BSBC Board welcomed five new members this year: Ann Favaloro, Irina Dmitrenko, Rich Kelly, Laura DePallo, Kelly Kampf, and Sandy Forester. We appreciate their willingness to be more involved and supportive of the BSBC, and wish them and all members and attenders fulfillment on the Dharma path. We look to the coming year to continue the growth of our Sangha, welcoming teachers to deepen our understanding of Buddhist teachings while expanding practice and service opportunities for our members and friends. All are truly welcome. 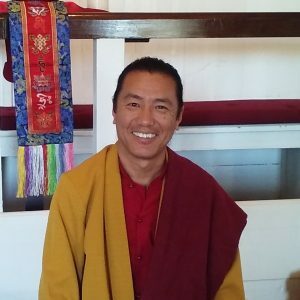 We are grateful for the opportunity to have served in a leadership role for the Buddhist Sangha of Bucks County for the past three years, and greatly appreciate the ready and willing assistance from so many who have made this past year so valuable and memorable as we travel this path together. This entry was posted in Home and tagged annual meeting, annual report. Bookmark the permalink.